THE STOCK DASH THAT WAS HEAVILY MODIFIED TO ACCEPT THE ROLL UP WINDOW DOORS. NOTE THE VERY ROUGH WORKMANSHIP IN THE FOLLOWING PICTURES. 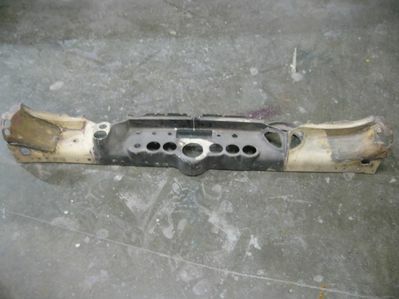 THE DASH WAS REMOVED BECAUSE OF THE POOR WORKMANSHIP IN THE MODIFYING OF THE DASH AND IT WAS EASIER TO REBUILD IT OUT OF THE CAR INSTEAD OF FIGHTING IT IN THE CAR. I BELIEVE THAT IT WAS ORIGINALLY BUILT OUT OF THE CAR.